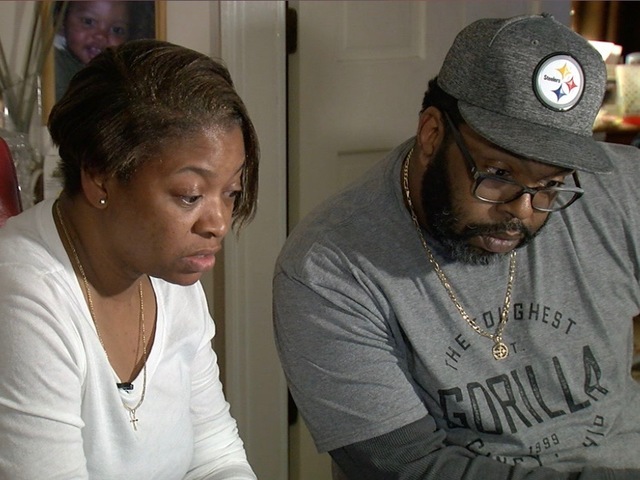 CINCINNATI, Ohio — He was wrong and then he was wronged: That’s how the parents of a 14-year-old jolted by a Taser view the 2017 incident that left their son with a broken clavicle and a delinquency finding in juvenile court. After reviewing the case, a Cincinnati Police Sergeant concluded the use of force complied with department policies. The teen “actively resisted” and “fled on foot,” injuring his clavicle by falling down a hill before being hit with the stun gun, according to the department’s incident report. Diondre Lee agreed his son should not have run. But he was also sickened by an officer’s casual description of his son’s tumble five minutes after it happened. Antionette Lee fought back tears as she watched video of her son’s arrest. The incident is one of 233 examples of how Cincinnati area police departments have used force on juveniles since January 2016. Kids ranging in age from 6 to 17 were identified in police reports, obtained by WCPO in public records requests. WCPO spent seven months analyzing reports and video from 32 local departments, compiling data on 2,500 use of force incidents since 2015. Our analysis showed the use of force is rare: It happened in less than 1 percent of all police runs in 2017. But there is a wide variance in how local departments measure and regulate the use of force, a disparity that has allowed questionable police behavior to go unchecked. RELATED: See the rest of WCPO's six-part series "Forcing the Peace"
WCPO also found differences in how force is used against juveniles. For one thing, it happens less frequently for teens than it does for adults. Since 2016, WCPO’s data shows 1,556 use of force incidents involving people over 18. That’s more than six times the total for juveniles. 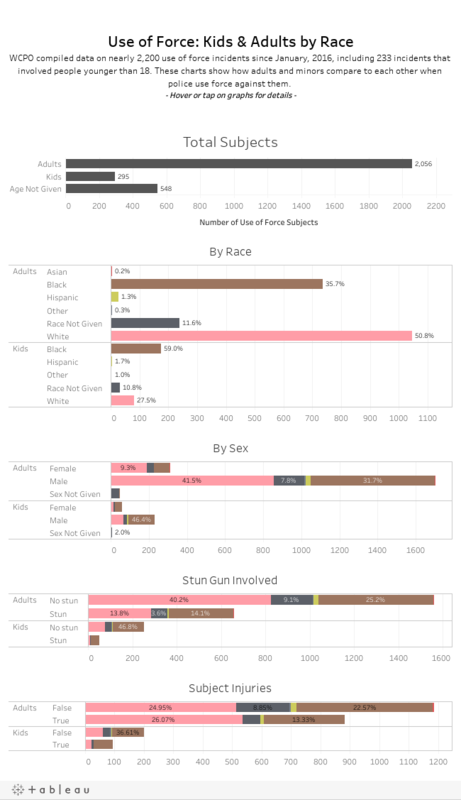 In addition, black juveniles (younger than 18) were more likely than adults to have stun guns deployed against them. Black juveniles were also more likely than whites under 18 to be injured in use of force incidents. Civil rights attorney Al Gerhardstein alleged “a pattern of excessive force against nonviolent young people” in Cincinnati when he announced a $240,000 settlement with the family of Donesha Gowdy. She’s the 11-year-old who was stunned with a Taser while being arrested for shoplifting at a Kroger store in August. In an Oct. 30 press release , Gerhardstein said his law firm investigated the Cincinnati department, finding 110 incidents of Taser use on minors from Jan. 1, 2013 to Aug. 14 of this year. All but six of the incidents involved black minors, Gerhardstein said. “I think that we have work to do to make sure that our use of force on children is racially fair and balanced,” he told WCPO when the settlement was announced. Cincinnati Police have not responded to WCPO’s questions on this story. WCPO reviewed studies published since 2016 that demonstrate officers are far more likely to use force against blacks and Latinos than whites — and that includes children. But the studies did not analyze incidents in the Cincinnati area and the author of one study told WCPO that every use of force incident is unique. So, it is still difficult to pin down the underlying factors that prompt an officer to use force in one case, but not another. The use of force specifically on juveniles has not been widely studied, but research published in June by the Justice Policy Journal estimates force is used or threatened in more than 30 percent of juvenile arrests and race is not a big factor in determining whether suspects are likely to have force used against them. It also recommended improvements in police training as a strategy to reduce the use of force. Procedurally just is not how Diondre Lee would describe the encounter between his son and Officer Kevin Kroger on March 2, 2017. In fact, he used a one-word description: "Sickening." Kroger later told his supervisor the car was used in an attempted shooting that morning, just a few blocks from where he found it in the 1800 block of Sunset Avenue. Lee’s son did not fit the description of the suspect wanted from the shooting, but he was the first of the five teenagers to be detained. When Officer Kroger attempted to “pat him down for possible weapons,” the teen pulled away and started running. Kroger caught up to the teen when he tumbled down a hill, twice firing his Taser before making an arrest. The teenager told police afterward that he had nothing to do with the shooting or stolen car, but ran because he had marijuana in his pocket. He was ordered in May 2017 to complete 20 hours of community service after a Hamilton County Juvenile Court judge found him delinquent based on two misdemeanor charges of obstructing official business and attempted trafficking in marijuana. Kroger said he did not give a verbal warning of the Taser because he thought the teen might have a weapon and did not want to give him “time to react.” It also appears from his body camera recording that Kroger did not know Lee’s son had an injured shoulder for about 15 minutes following the arrest. But it was a painful 15 minutes for Diondre and Antionette Lee, who watched the video for the first time when WCPO visited their home on Nov. 29. The Lees were upset that their son was detained even though he did not match the description of the felonious assault suspect. Mrs. Lee was surprised when Kroger fired his Taser a second time. Diondre Lee was visibly shaken by the exchange, which he took as a sign of indifference about an injured child. Lee said he has family members who serve as police officers in other cities and he appreciates the difficult circumstances they face. But he also questions how much of a threat his 130-pound son really posed to Cincinnati Police on the day he was arrested. And he’s bothered that they did not seem to care about his injury.